A while back, my counselor recommended to me that I needed to read Thich Nhat Hanh’s Peace Is Every Step. I recognized the author’s name only because he was a friend of Thomas Merton and had written the introduction to Merton’s Contemplative Prayer. I am glad she led me to discover more. If you find yourself stuck in the day to day busyness of life and can’t find a way to simply remember how to breath and how to be, there are few better guides than Thich Nhat Hanh. 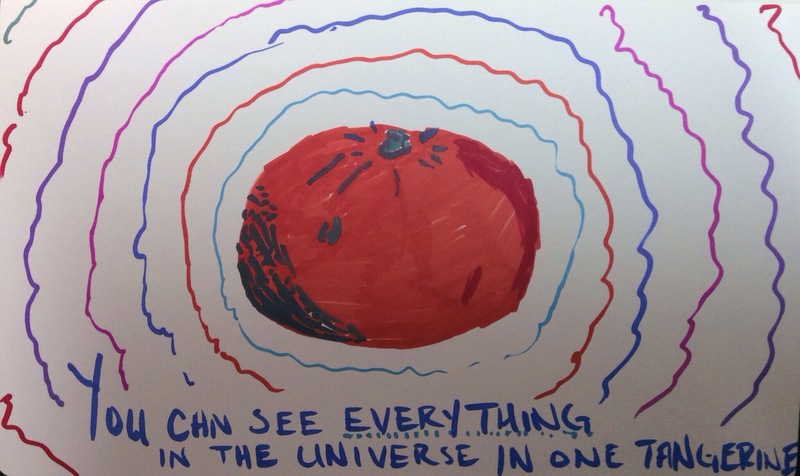 After reading his chapter on “Tangerine Meditation”, I drew the following picture as some small gesture of myself trying to live deeper into the reality of the present moment.